One of the neat little features that is included with the 5.5 version of the vSphere is a new identity source option for Single Sign-On (SSO) 5.5. If you think back to the SSO 5.1 options for identity sources, you had three options: Open LDAP, Active Directory (requiring anonymous or user authentication), and Local OS. The new kid on the block with SSO 5.5 is Active Directory Integrated Windows Authentication. Want to know more about SSO 5.5? Check out my vSphere 5.5 Improvements deep dive series. Authentication to the domain is handled by two options: either using the machine account of the server itself or providing a Service Principal Name (SPN). In this post, I’ll go over both methods in detail. If you’re doing an all-in-one install of vCenter roles onto a Windows box, you should be in the clear – vCenter has traditionally required that the Windows box be joined to the domain anyway. If you’re using the vCenter Server Appliance (vCSA), which is a SUSE Linux box, you’ll need to make sure you’ve joined the appliance to the domain. It’s relatively straight forward to join your vCSA to a domain – just navigate to the vCenter Server Appliance admin interface > vCenter Server > Authentication. Enter your details in the boxes below. Reboot if you want to, mine worked without a reboot. Alternatively, you can provide the SPN, UPN, and a password. Probably one of the best posts out there that explains the process of creating, viewing, and editing SPNs can be found here: Service Principal Names (SPNs) SetSPN Syntax (Setspn.exe). SPNs are generally accepted as a more secure method of access, as the intended host name that runs the service is included in the SPN. If you do need to go down this route, make sure to create an SPN on your service account. Here’s the command I ran on my Domain Controller. 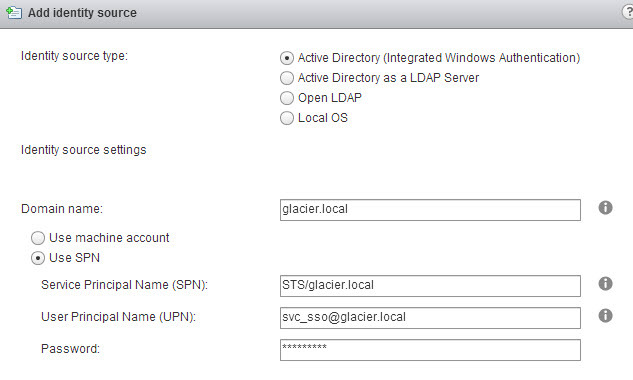 Once completed, you can even look up your SPN values for the host and service account using Active Directory Users and Computers (aka A-Duck). You’ll need to turn on Advanced Features in order to see the Attribute Editor in the object properties. Good post, thanks! Just wanted to fill in a couple of things I didn’t figure out immediately. I ran into a few issues with this (mostly simple), and thought others might benefit from what I experienced. 2. 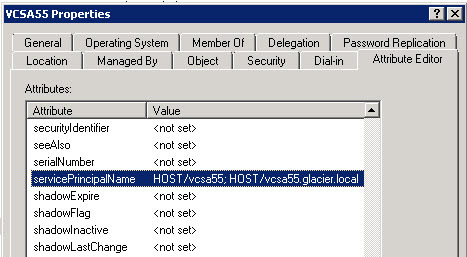 If you’re going to put your VCSA in a subdomain of active directory (i.e. subdomain.domain.com), make sure you name the hostname of the VCSA “hostname.subdomain.domain.com” before you join it to the domain. 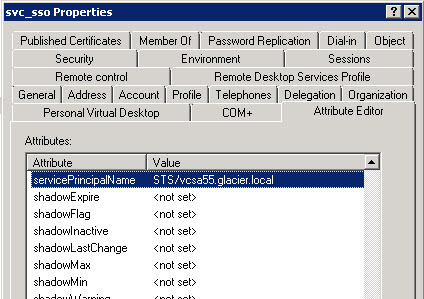 I noticed that the SPN in Active Directory does not change if you change the hostname of the VCSA after the join process, so you’ll have to undo the domain join on the VCSA, delete the computer object, rename the VCSA, regenerate the certificates, and then rejoin the domain. We were initially able to poll the directory and see AD accounts, but adding any AD accounts under Manage->Permissions would have no affect on the ability to log in until we recreated the AD authentication link with the new (correct) hostname. 3. It seems like there’s some Domain Administrator inheritance at play, even for the VCSA. My DA account has permissions to login to vCenter, even though I’ve never assigned it any Permissions within vCenter. It can’t view any objects, but it can login to the Web Client, and C# client. Seems like some of that was touched on here too: KB 2059528. Didn’t think I’d see any of that on the VCSA, but DA’s do have login rights once you join a domain, if that inheritance is in your AD groups. What if you have 2 domain (A and B). Domain A trusts B but B does NOT trust A. vCenter SSO server is joined to domain A. I need to add Users from B to access vCenter. Would I create an SPN account on domain B so I can add users from domain B? You would need to add Domain B as an Identity Source. 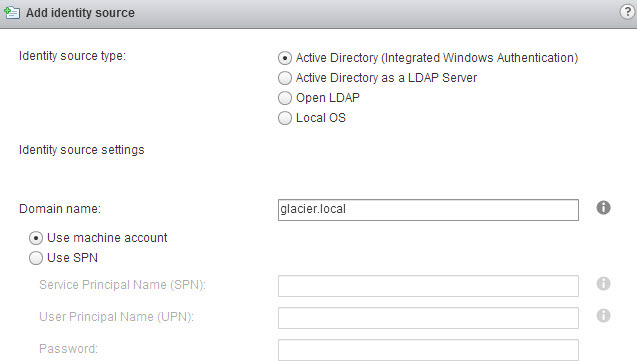 I’ve not tried adding two domains via the SPN method; I typically use the “Active Directory as an LDAP Server” method. I’ll try that! Thanks for your response!